Whether man-made or elements of nature, familiar signposts across North Carolina signal that you’ve almost reached your destination — or that there’s still a way to go. I come around the corner at Woodville Baptist Church, past the barns and fields, through a pinch-point of woods, and suddenly the world widens to marsh and water and the low slab bridge across the broad creek. When the tires rumble on rough concrete, I look to the north, fingers crossed. There it is: a small skiff, wood planks painted white as a sand dollar, tethered to a lone stake at the edge of the shallows. Behind it, white sandy banks breach Ward Creek. Green marsh presses close. It’s a slack tide, but the skiff is taut on the line, like a kite on a string, its bow to the bridge, and I think, without really thinking: A south wind today. No map, nor any smartphone navigation app, can do for me what that white skiff on Ward Creek does. It fixes me in a matrix far more complex than latitude and longitude. It positions me in a cartography of history and culture and place. There’s the white skiff, so the winds bending the marshes are kin to the winds that ferried Diamond City’s residents to refuge on the mainland after the 1899 storms. There’s the white skiff, so I’m not far from the mullet camps at Core Banks, just 50 years late. 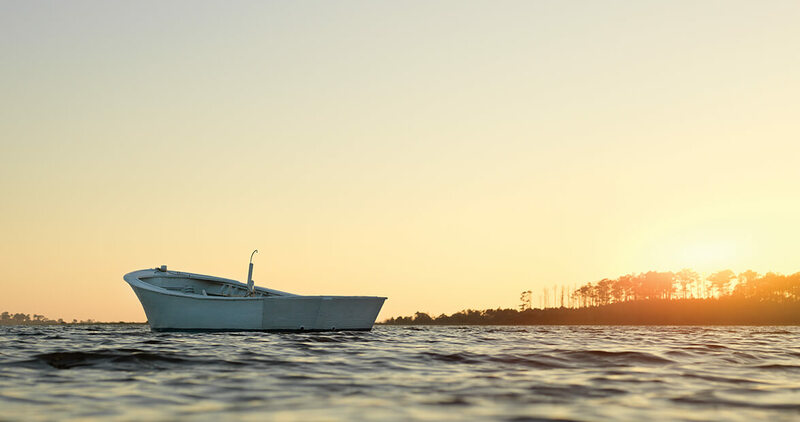 I look for the white skiff on Ward Creek every time I drive Down East, past Morehead City, through Beaufort, headed towards Harkers Island and beyond. I see the skiff, and I know where I am. I know nothing about the boat. I don’t know if it’s run by some clammer working to put his kids through college or some weekender who leaves it in the water because she’ll be back next Friday afternoon. And I’m not sure I want to know. I’d rather not attach a name to the boat at Ward Creek. I don’t want to weigh it down with any specific provenance, or freight it with details. I’d rather it have no meaning other than what it means to me: After the long drive, toward the end of the journey, when I see it, I know where I am. For most of us, certain landmarks speak deeply, the sight of which roots us to memory as much as to place. They are cairns on the path to who we have become, and waypoints to our spirit. I came across the skiff at Ward Creek in my earliest days as a writer, when I was based in Beaufort for a long-vanished magazine called The Maritimes. For a year, I plumbed every corner of eastern Carteret County, interviewing mariners who’d been twice torpedoed by German U-boats, and old boatbuilders and old fishermen who took me to old burying grounds on Core Banks, and decoy carvers from Stacy to Cedar Island. Heading east on U.S. Highway 70, miles beyond Beaufort, I’d see that skiff at Ward Creek, and know that I was off on another amazing discovery. It became a metaphor, of sorts, for my budding career. I’ve loved it ever since. But it’s not the only landmark in North Carolina that tells me where I am in relation to my history. Early on, I developed a strong sense of this place-association. Driving with my parents, I would crane my neck to be the first in the car to see the ocean or spot a real mountain as we crested the rolling Piedmont hills west of Winston-Salem. See them now, and long-forgotten memories boil up out of seemingly nowhere. Although I know that some of these landmarks are looming, and watch for them through the windshield, others catch me off-guard. There’s the jagged crag of Hanging Rock that slowly rises above the trees as I drive NC Highway 89 toward Danbury. I look and look — I can’t ever remember which curves hide the mountain, which wooded ridge gives way to the first glimpse of the peak — but the instant it flickers into view between the trees, I think of blue suede hiking boots. When I was a kid, my family took frequent day trips to Hanging Rock. I could run up and down the trail, but I had to stay within sight of my mother. I could see her blue suede shoes from a mile away. Headed the other direction, on Interstate 40: There’s a place where the road seems to crest a plateau, then dives downhill as the land suddenly falls away. You don’t know it — you can’t know it, with all the trees — but very suddenly there’s a broad view of flat land unfurling. It lasts for just a few seconds before the forest swallows up the horizon, but I know it: I’ve crossed into the Coastal Plain. I’ve gone from red mud to sand and clay. Tomato to vinegar. No further explanation needed. There’s the hook of Table Rock mountain, a notch in the sky. You can see it as far away as Hickory. 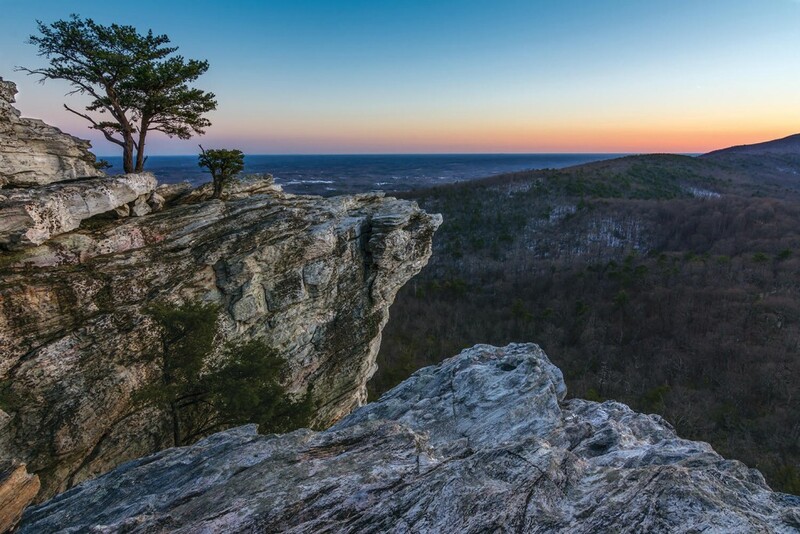 From 50 miles away, I can see it and know: Below that hunched-up horizon lies the glories of Linville Gorge. I could be an hour away from Table Rock, but when I see its silhouette, I can hear the Linville River. I can smell the mountain pine. My knees might throb with phantom pain, recalling the descents down Babel Tower Trail. Although I know that some of these landmarks are looming, and watch for them through the windshield, others catch me off-guard. I come around a bend, and out of the corner of my eye — I see it. I cross the bridge and there they are: the Deep River rapids, the bones of the fall line scattered for a hundred yards up the green chasm below, and I know I’m an hour from the house. You come around the trail, and there it is: the double hump of Potato Hill and Cattail Peak, a view that roots you to Black Mountain bedrock. At Dinkins Bottom, where U.S. 421 crosses the Yadkin River, my eyes automatically scan the woods for a deer stand that’s overlooked those massive cornfields for as long as I can remember. One hundred ninety-one miles to the southeast, I crest the bridge over the Northeast Cape Fear and look to the right at the soaring sand cliff over the river. It’s the remnant dune of an ancient sea. Wilmington is right around the corner. You see them, and you know: There you are. When I think about it, most of these are large, permanent landscape features, and although we can harm and tarnish and diminish them, they’ll still be around for generations to come. Pilot Mountain isn’t going anywhere. The broad cornfield at Dinkins Bottom might grow over, but the Yadkin River should flow pretty close to forever. Grandfather will lord over the High Country for another few hundred thousand years, at least. The Cape Lookout Shoals — I can see them from halfway down Shackleford Banks as I beat my way upwind, the boat churning through the chop, a white stitching of spume and spindrift in the open Atlantic — speak of fish and danger, all wound up together, and they’re not going anywhere, either. But other features in the cartography of my life in North Carolina that are more fragile than an eons-old oceanic sandbar. These landmarks are largely man-made, and while I realize that these special places aren’t for forever, it’s still a blow when they change in some significant way. We get bound up and wound up in the places we treasure, and woe to those who would change them without our blessing. Off Interstate 40 near Kernersville, there’s a tall sign that marks a Wise potato chips distribution center. At night, the Wise owl glows aqua and green, a beacon. The first time I ever went squirrel hunting was in the woods on the far side of that sign. I remember fox tracks in the snow, and sitting on a wet log, and seeing the oversize owl winking through the trees. The sign is still there, but the woods it marks in my memory are gone. I won’t even look in that direction when I’m driving down the highway. The old, rustic J&H Stables barn near Umstead Park? Every time I drove past it, I thought of birthday parties and a pack of 8-year-olds hanging on for dear life. Gone now. So, too, Stevenson’s Grocery in Creedmoor, with its pool hall and streak o’ lean biscuits. The beech tree in the woods behind my childhood home. And the skiff at Ward Creek. Who knows how long it will be there, tethered to the pole, tied taut to my psyche? And when was the last time I crossed that bridge? As I write this, it occurs to me: I don’t even know if the skiff’s there today. My next thought should come as no surprise: I better get going.